A Feather board without ambition is a Feather board without FeatherWings! Spice up your Feather project with a beautiful 3.5" touchscreen display shield with built in microSD card socket. 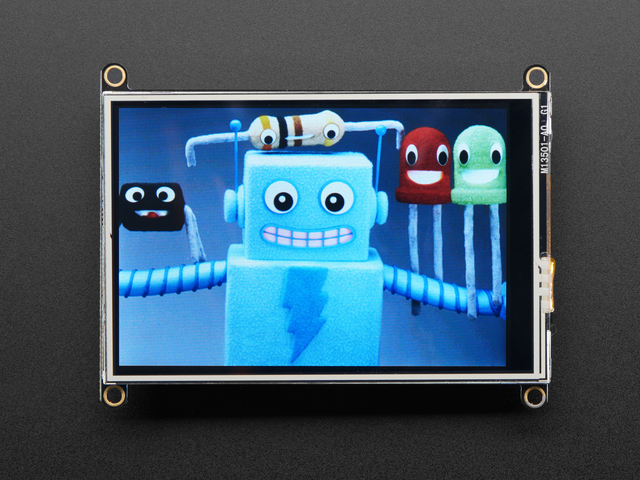 This TFT display is 3.5" diagonal with a bright 6 white-LED backlight. You get a massive 480x320 pixels with individual 16-bit color pixel control. It has way more resolution than a black and white 128x64 display, and twice as much as our 2.4" TFT FeatherWing. As a bonus, this display comes with a resistive touchscreen attached to it already, so you can detect finger presses anywhere on the screen. This FeatherWing uses a SPI display, touchscreen and SD card socket. It works with any and all Feathers but given the large display it works best with our faster boards like the ESP8266, ESP32, M4, M0, nRF52, WICED, and Teensy. We also include an SPI resistive touchscreen controller so you only need one additional pin to add a high quality touchscreen controller. One more pin is used for an optional SD card that can be used for storing images for display. This guide was first published on Oct 25, 2017. It was last updated on Oct 25, 2017. This page (Overview) was last updated on Apr 18, 2019.